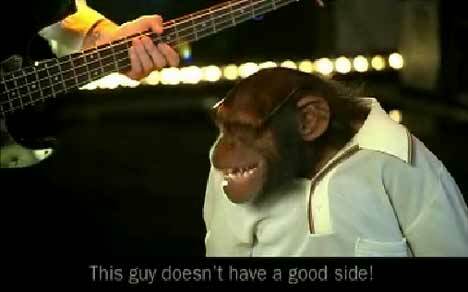 Chicago alternative/pop punk band Fall Out Boy has released the music video for Thnks Fr Th Mmrs, a mockumentary showing the making of a music video by a crew of chimpanzees. Patrick Stump, lead singer/guitarist, looks to bass guitarist Pete Wentz for confirmation that working with apes is going to be worthwhile. His fears are confirmed when the director Alan Furryson (a reference to the real director’s name) yells cut and suggests he would have been better working with Panic! At The Disco instead of FOB. It’s not as if Stump can’t relate to chimps. He’s shown playing chess with an orangutan later. The stress of working with apes starts to wear thin. Drummer Andy Hurley storms out when he discovers a chimp has taken over his drum set, knocking over a monkey on a barrel, joined by lead guitarist Joe Trohman in a Chevy Tahoe. 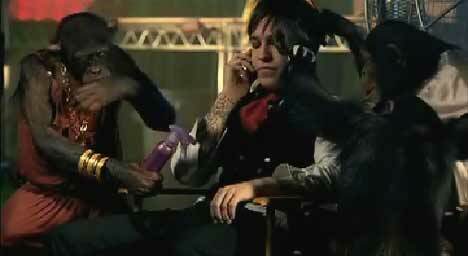 Pete calls William Beckett (lead singer for The Academy) on his mobile phone while having his face made up by chimps. In the dressing room lead guitarist he applies TAG Body Spray’s “All-Nighter” fragrance only to discover a pair of chimp’s arms caressing his chest. He’s given lessons on how to kiss a woman (Kim Kardashian) by the director. He finally loses his cool though when the director starts fondling the woman while the band is playing. 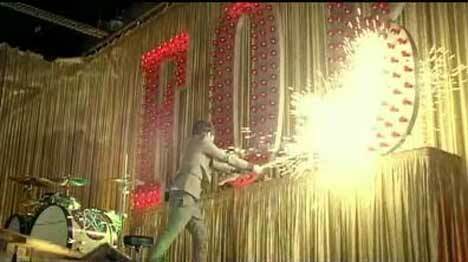 He takes his guitar and knocks down the “B” from the stage’s “FOB”, leaving it spelling F.O. TAG Body Spray assisted Fall Out Boy in providing an iPod version and full screen QuickTime version of the video free to visitors to the Fall Out Boy site until the video was released on iTunes. Download the music video at iTunes. Thanks For The Memories was filmed by Anonymous Content director Alan Ferguson, who also directed the earlier FOB music video, “This Ain’t a Scene, It’s an Arms Race”, director of photography Shawn Kim, executive producer Sheira Rees Davies and producer Jacquie Frisco. Post production and visual effects were done at Artichoke, New York. Online editor was Tim Huchings. Editorial work was done at Company X, New York, by Megan Brennan, with assistant editor Dave Madden, executive producer Rachelle Way. Sound was designed at Sugarbox, New York, by Megan Brennan and Jeff Slutz, with executive producer Rachelle Way.